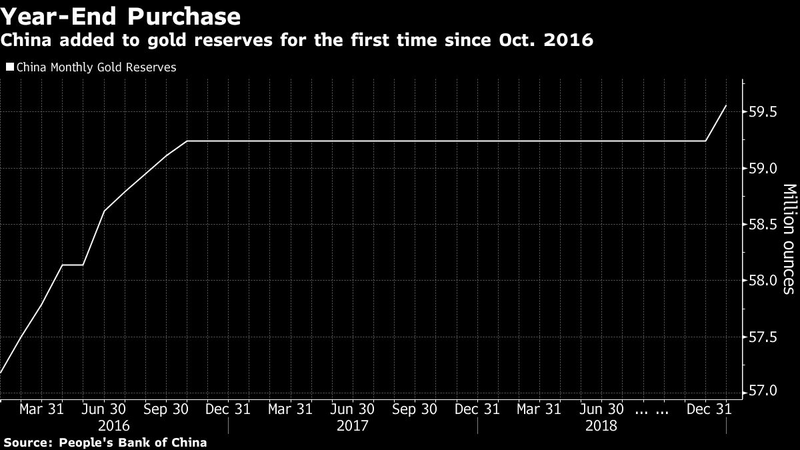 After a hiatus of more than two years, China is adding to its gold reserves again. The People’s Bank of China increased holdings to 59.56 million ounces by the end of December, or about 1,853 metric tons, from 59.24 million ounces previously, according to data on the central bank’s website. They had been unchanged since about 130,000 ounces were added in October 2016. The world’s biggest producer and consumer boosted holdings of bullion in a month marked by mounting concerns that China’s trade dispute with the U.S. is threatening economic growth. Spot gold had its strongest month in almost two years as those fears spurred gyrations in equities and the dollar and boosted demand for the precious metal as a haven. It’s not just China buying, Poland and Hungary surprised the market in 2018 by adding to their gold holdings for the first time in many years. Speculation that the Federal Reserve may pause its interest rate hikes has given further strength to gold’s rally into the new year and assets in bullion-backed exchange-traded funds are at a seven-month high. Spot gold was trading 0.5 percent higher at $1,291.83 an ounce. The Asian nation has previously spent long periods without revealing increases in gold holdings. When the central bank announced a 57 percent jump in reserves to 53.3 million ounces in July 2015, it was the first update in six years. “I’m always wary of year-end moves, but if they buy again, then it’ll look like they’re on another run of additions, like they did in 2015-2016.” Turner said. It’s not just China buying. Poland and Hungary surprised the market in 2018 by adding to their gold holdings for the first time in many years. Central banks were expected to increase their purchases of gold in 2018 for the first time in five years as eastern European and Asian countries seek to diversify their reserves, according to an October projection by consultancy Metals Focus Ltd.